In the nature Yang Metal is represented as raw metals and minerals, therefore it needs to be forged or processed to become useful. Yang Metal people have potential to be honed into something like a sword, as powerful as the Excalibur and one can forge them to get better. They are driven and although they may complain a lot, they could take the hardships that life throws their way and survive it. Despite their stern façade, people under this sign values friendship highly and you can count on them to offer a helping hand when you are in dire need. These people also have a good sense of justice and they will fight for what is right. Yang Metal people will go after what they want and they will cut through anything to achieve their goal. In the case they don’t have a direction in life, they need more experience and tough training, and once they have been forged, they can achieve anything. Yang Metal people need a systematic way to accomplish something and once they have thought of the best way to proceed with something, they will stick to it. These people are bound to be successful in life if they have focus and clarity; otherwise, they will feel lost. To the people under the Yang Metal sign, being number one is everything, if they don’t grab the top spot they feel as if they have failed. At the same time, these people are the ones who don’t back down from challenges and they will seek to win over all those hurdles. Those who are under the Yang Metal sign are all about keeping up appearances and they will focus more on saving face than on anything else. Since these people value their pride so much, they will not admit that they have committed a mistake easily. Yang Metal people seem to be cool most of the time but once they are in a fight, they tend to lose their ability to stay rational and they will fight until they win. Once they are in their fight mode, they wouldn’t care why; even if they have nothing to gain they will soldier on. More than anything else, Yang Metals are so competitive that to them it defines the image they have of themselves. These people tend to compare themselves to other people and they are afraid of failing or the possibility thereof. Yang Metal people want to always look cool and that they are on top of things so they often appear to be too tough to crack to the people who don’t know them. Since these people fear falling short compared to everyone else, they feel great when they know they look great. The people under the Yang Metal sign are the ones who cannot allow unfairness in this world and they would fight for it, especially if they have to help a dear and close friend. In the same way, they have the tendency to be very stubborn and hasty in the way they act which could lead to dire results. Yang Metal is strong if born during the autumn months, but weaker during all other seasons. 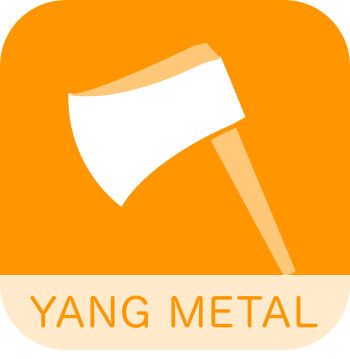 If Yang Metal is weak it needs more metal element for balance. Earth on some occasions can provide strength as well, but only if combined with water. Dry earth will make metal shine. Yang Metal represents steel, therefore when strong, it will prefer an element of Yin Fire, to forge it, and Yang Wood, to become useful and effective. Yang Fire can also be useful but it’s less effective than Yin Fire. In featured characteristic, we point out some special issues which are essential to understand and deal with Yang Metal people. Yang Metal people are specific for their need for pressure. Yang Metal represents heavy and raw metals in nature, and it needs a Fire element to make it forgeable. This allows it to be shaped into a weapon or useful tool. Without pressure, Yang Metal people can become extremely lazy and unable to act on things or make decisions. So, at a young age, it’s best for Yang Metal people to go through tough training, like military service, highly competitive sports or demanding schools. This will build a good foundation for their future and put them in the habit of accepting pressure, which is the key mindset for their development. Large intestine, navel, bones, and skin. When Yang Metal is balanced, the person can expect to have a healthy large intestine and circulatory system function. Excess Yang Metal may manifest as constipation, dry skin, or weakness of the immune system. Deficient Yang Metal may reveal itself through poor Qi circulation and problems in large intestines, bones, or skin. Raw precious minerals, hidden away. You transform into a deadly sword’s blade or an ordinary man’s machine. and machines that never stop. Never-ending persistence to reach the goal. As you are the one to bring it to the end.